At 9:25am on September 21, an Osprey aircraft took off for its test flight at the U.S. Marine Corps Air Station Iwakuni, in Yamaguchi Prefecture. 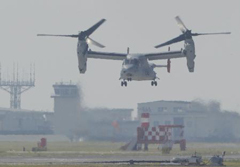 On September 21, at the Iwakuni base in Yamaguchi Prefecture, the U.S. Marine Corps began test flights of the MV-22 Osprey vertical take-off and landing transport aircraft. The MV-22 squadrons are staying temporarily in Iwakuni, before they move on to Futenma Air Station. These flights are the first for them in Japan. After completing the test flights, if possible, the Marine Corps plans to move the aircraft to the Futenma in several stages in October. The Marine Corps plans to have them fully operable in October within Okinawa, and then to send some of the MV-22s each month to Camp Fuji, in Gotemba, Shizuoka Prefecture, and to Iwakuni. They will carry out low-level flight training for the aircraft in Honshu, Shikoku and Kyushu. The governments of Japan and the United States are moving to have full-scale operations start before the end of October despite a mass protest rally in Okinawa on September 9 and increasing calls to cancel the deployment to Futenma. Their hard-line approach can only further intensify the Okinawa people’s opposition to the deployment. Seven MV-22s of the dozen aircraft in Iwakuni have conducted test flights. This was carried out in training airspace above the Sea of Japan, called “R134” which is off the coast of Shimonoseki, Yamaguchi. This airspace covers an area off the coast of Yamaguchi and Fukuoka. The Marine Corps says that it will avoid flying over land areas if possible, including when it moves the aircraft from Iwakuni to Okinawa. The Marines carried out the test flights to check to see if the aircraft and its systems respond correctly to normal and abnormal situations during take-off and landing. At 9:25am on September 21, one MV-22 took off from the Iwakuni base. The Marines conducted eight flights in total until 6:00pm that day. The MV-22 carried out hovering training within the grounds of the base. In the morning, about 70 people belonging to citizen groups held a rally to protest against the test flights around the base, shouting and raising banners indicating their opposition to the deployment of the MV-22s.